Susanne Johns Marr passed into eternal rest on April 6, 2019 at the age of 89. She was the Daughter of Susanne Marion Johns and William Harrison Johns. She was predeceased by her beloved husband Fred J. Marr of Leesville, two sisters, one brother, and one son-in-law. She is the beloved mother of James “Jim” Edward Teer, Jr. (Sandy) of Indiana, Susanne Pope [Barry, (deceased)] of Illinois, Bobbie Newhouse (Kenneth, Sr.) of Leesville, Gloria Jane Usher (Paul) of Lexington, Melinda Hewlitt of Columbia, William “Bud” Marr (Cheryl) of Florida, Beth Carrigg (John) of Irmo, 14 grandchildren and 20 great grandchildren. She was preceded in death by a grandson. She was a member of First Calvary Baptist Church, Leesville, SC. She served her Lord through delivering sermons to Shut-ins and served as a member of the women’s prayer group. She served her country by caring for our Nations Veterans. She was the wife of a three-time war Veteran, mother of two Veterans, and grandmother of seven Veterans. She was a daughter and granddaughter of a veteran. She also served as a Volunteer supporting Veterans at William Bryant Dorn VA Hospital in Columbia for ten years. In lieu of flowers please make donations to Agape Hospice Foundation or The Alzheimer’s Foundation. 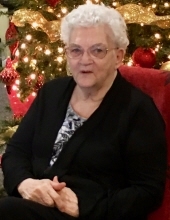 The family of Mrs. Marr would like to express appreciation to Agape Hospice House and Suites of Lexington, SC and Carolina Gardens of Lexington, SC. for the loving care provided to our beloved. A memorial service will be held at 6:00 P.M. Tuesday, April 9, at Milton Shealy Funeral Home Chapel. The family will receive friends after the service at the funeral home. A private family burial will be held in the Florence National Cemetery. To send flowers or a remembrance gift to the family of Susanne Johns Marr, please visit our Tribute Store. "Email Address" would like to share the life celebration of Susanne Johns Marr. Click on the "link" to go to share a favorite memory or leave a condolence message for the family.